DeAndre Jordan is an All-Star basketball player who currently plays for the Dallas Mavericks after having spent 10 years in Los Angeles with the Clippers. The former Texas A&M University player, who is noted for his defensive abilities which have been compared to that of the legendary Hall of Fame player, Bill Russell, is also a two-time NBA All-Defensive Team member that can be unconquerable when his mind is at it. DeAndre Jordan was born Hyland DeAndre Jordan Jr., the eldest of three children to Kimberly and Hyland Jordan on the 21st of July 1988 in Houston, Texas. He began his journey to play professional basketball at Episcopal High School, where he was noted for dominating his peers on the court. Jordan, however, did not finish his high school at Episcopal as he transferred to Christian Life Center Academy where he completed his senior year. By the time he was graduating, he was a two-time all-state and a third-team Parade All-American selection which meant he was heavily recruited by a number of teams, including stand out programs like Florida State, LSU, and Kentucky. Jordan, however, opted to stay in his home state and attend Texas A&M University. In his freshman college year, DeAndre Jordan started 21 of 35 games and averaged 7.9 points, 6.0 rebounds, and 1.3 blocks per game. His efforts earned him a selection to the Big 12 All-Rookie Team at the end of the year after which he announced he was entering the 2008 NBA Draft where he was selected by the Los Angeles Clippers with the 35th overall pick. During his 10-year spell with the Clippers, DeAndre Jordan accomplished several feats, including playing the most games in the team’s history and becoming the franchise’s all-time leader in total rebounds before opting to move back to his home state and join the Dallas Mavericks in July 2018. According to the celebrity net worth website, DeAndre Jordan has a net worth of $40 million. The three-time All-NBA star has been able to amass his wealth through his various contracts with the Clippers over the years, and now the Mavericks as well as through endorsement deals with brands like Under Armour. Jordan’s first contract in the NBA was a 3-year deal worth $2.14 million which was agreed upon in July 2008. His next contract was a four year $43 million deal to remain with the Clippers in December 2011. In July 2015, he put pen to paper on a four year $87.6 million deal to further extend his stay in the City of Angels. That deal ran until July 2018 when it expired, giving room for him to join the Mavericks on a one year $22.9 million contract, making him the 2nd best-paid player on the team’s roster. DeAndre Jordan has been linked to Mexican-American model Amber Alvarez for a long while now. Alvarez, who was born and raised in Dallas, Texas, has been pursuing a career as a model ever since she was discovered by a modeling scout in a mall when she was 16. The two reportedly started dating in March 2013 after meeting each other at a social event. They subsequently began sharing photos of each other on their social media platforms and were even spotted side by side attending the movie premiere of the Teenage Mutant Ninja Turtles in Los Angeles. Following a bump in the road in their relationship, the pair were said to have broken up but, however, they have been speculation that the two lovers have mended fences and are back together, although they no longer share photos of themselves on the social media, leaving the public to speculate about their relationship. 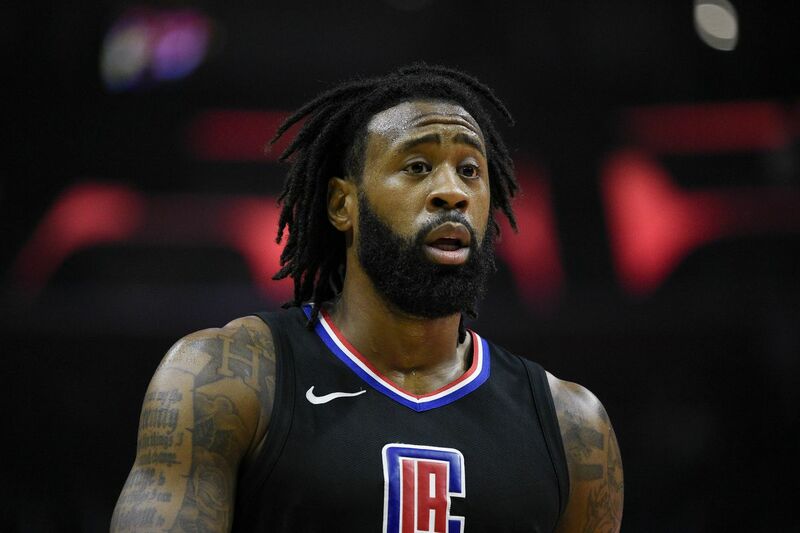 The bump in the road in DeAndre Jordan’s relationship with Amber Alvarez was that he fathered a child with another woman only identified as Ashley Rose White in 2015. Jordan, after taking a DNA test to prove paternity, has fought to play an active role in the life of his son Jaden. Sometime in 2016, he and his baby mama were in court over a custody disagreement which the judge agreed to split. DeAndre Jordan has a very impressive height of 6 feet 11 inches (2.11 m) and a weight of 65 lb (120 kg) which has allowed him to be so dominant in the paint and on the board as he has twice led the NBA in rebounds.